TP bows, tied with dental floss. 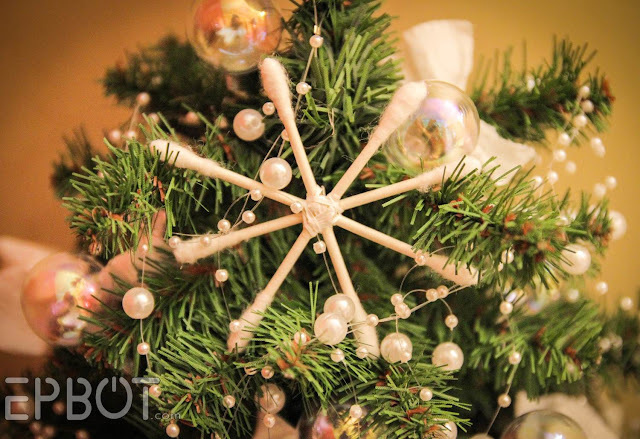 And Q-tip stars, secured with hot glue, then tied with more floss. 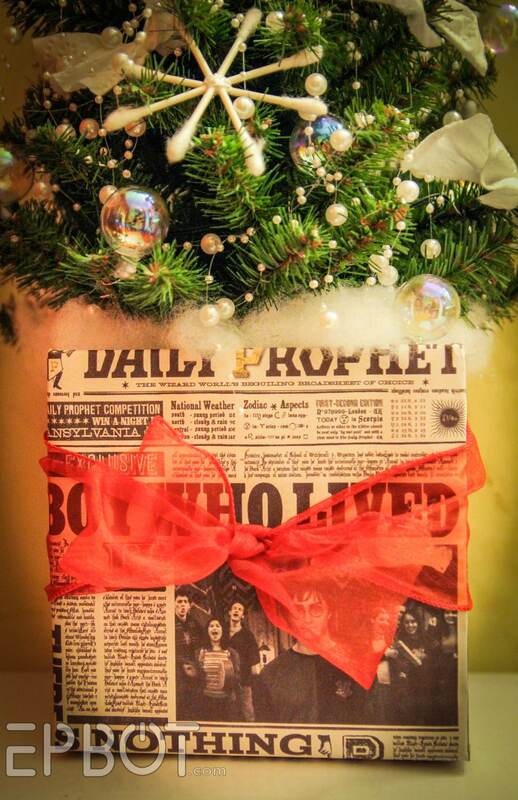 Instead of a tree skirt I covered a small box in sheets of the Daily Prophet (found with Google & printed out), and tied it all up with a bow. I filled the gaps in the box with sparkly polyfill, which also looks a bit soapy. All that's missing is Myrtle's name, but I can't for the life of me figure out a good way to add it. A gift tag, maybe? Or a tiny gift? Special ornament? HALP. And finally, the piece de resistance, which I'm so excited about I really AM going to bust, you guys. Here it is: We've wired the bathroom for sound (by hiding a blue tooth speaker in the bathtub), and for the party we'll be playing a custom audio mix John put together on Ambient Mixer, including actual snippets of Myrtle speaking. AND IT IS SO COOL. Mildly terrifying, but cool. For copyright reasons I can't let you hear the mix with Myrtle in it, but here's the same mix without her, and then here's Myrtle's dialogue from Youtube, which John added in. He didn't use much; just the ones of her squealing/moaning, a splash, and asking "Who's there?" These bits are set to play randomly, so you never know when to expect them, and even knowing they were coming scared the bejeepers out of me when we tested it out in our echo-y bathroom. Bahaha! 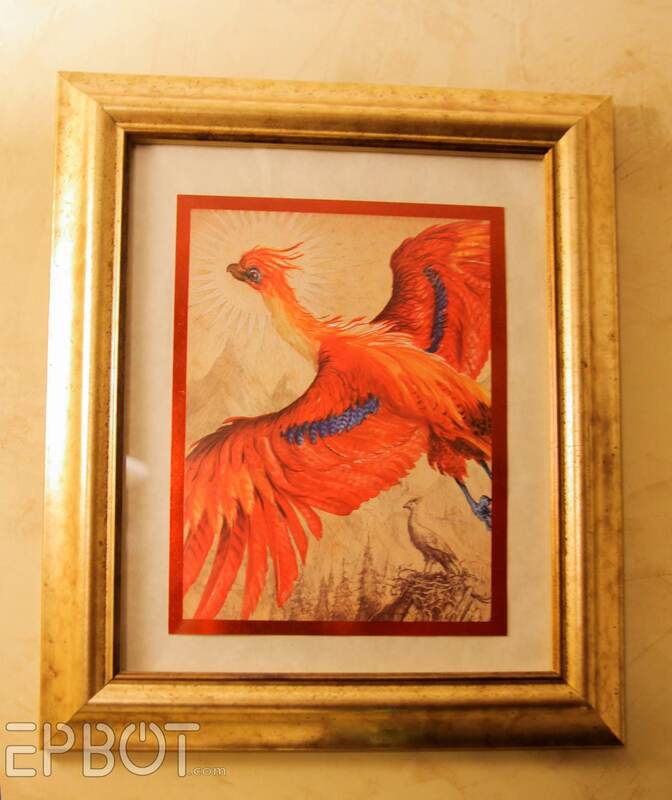 The 5X7 print was a free give-away card from Barnes-and-Noble last month; it's an ad for Fantastic Beasts, I think. Gorgeous, right? And the foil edge makes it look like a Christmas card. Lurrrve it. Speaking of art, let's end by announcing some Art Round Up winners! So, this month's randomly selected Wild Card winner is LacyJ. Everyone else, stay tuned for lots more party crafts and photos; I have a feeling it's going to take me all month to show you everything we've been up to! And I can't wait. I think the technical term is "SQUEEE!!!" I love what you've done. Ah-mazing. It makes me want to have a party of my own- but that would mean I would have to like, talk to people and stuff. I'll just live vicariously through you! I was just thinking the same thing! Seconded! Exactly what I was thinking! That would be perfect! Is there a way to print a picture of her face on translucent vellum (life size) so that it looks like she's peeking around the corner of the shower curtain? Or maybe put her face on the wall behind the shower curtain so when people pull back the curtain to see where the noise is coming from, they see her face? We considered doing that on the bathroom mirror: print her face on a transparency, then paste it on. Your way would be less obvious, though; I like the idea of putting it on the wall instead! BTW, great job! Love the bathroom! Be sure to update us with new pictures on anything else you decide to add. When my former house had a Halloween party, we put a print out of Myrtle on the inside of the toilet seat cover. So you flip up the cover to pee and BAM! Myrtle staring at you. Print he face on a circle of transparency the same diameter as your glass ornaments. Roll it up and insert it in the ornament. it will unroll and look like Myrtle is floating in the soap bubble. I feel terrible, but I have to admit I don't know who Myrtyl is. Please don't ban me from the site!!! But I LOVE the bathroom tree! Such a great idea, very cute and bathroom appropriate! Ok...thanks to google, I now know who Moaning Myrtle is. So cute! Maybe a gift tag addressed to Harry from Myrtle since she had that otherworldy crush and all. Or, in an instance of getting in the spirit of the season (HA! 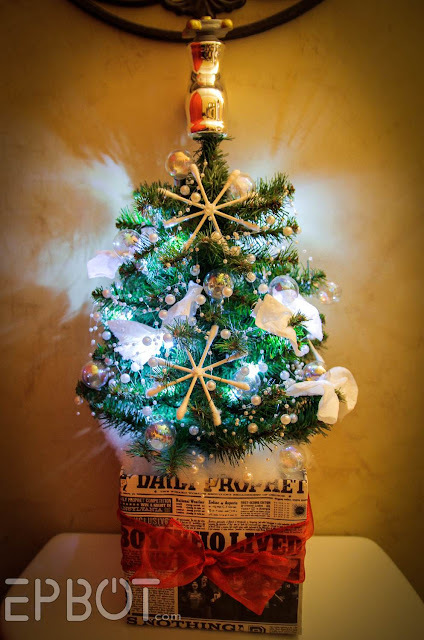 ), make it "To Myrtle, From Harry"
I never woulda thought a mini tree covered in ornaments made out of toilet paper and Q-Tips could be cute, but WOW. That is awesome. 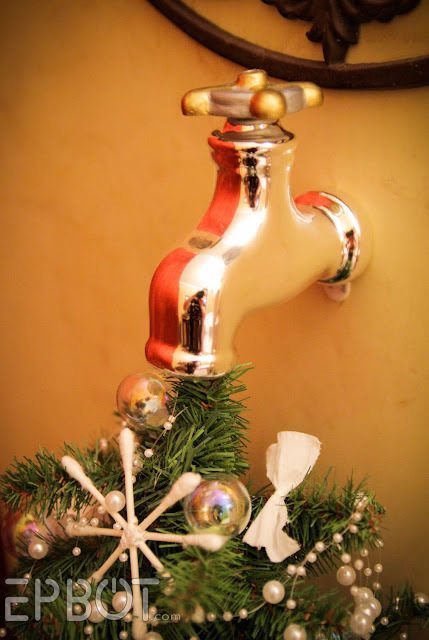 I was wondering why on earth they'd have an ornament of a faucet in the first place, but I think your project pretty much answers that question. I bow down before your crafty genius! AH MAY ZING!!!! So so so creative and perfect!! That is hilarious! You guys are awesome. I wish I could see your guests' faces when the moaning starts. With Myrtle actually BEING in the bathroom, do you think you still need to 'put her mark' on the tree? I personally would like to think I could make the connection, but of course I have the benefit of this post! 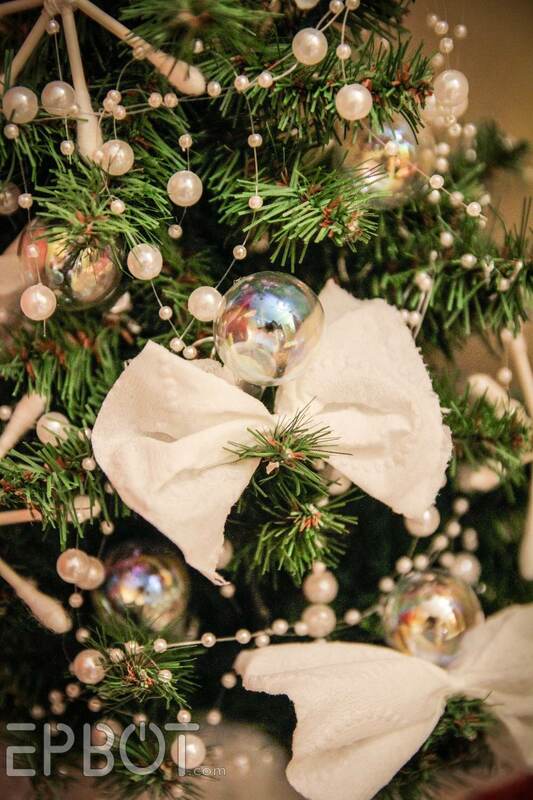 If you do still want to make it clearer, what if you added some additional ornaments made by Myrtle... maybe some "M"s made out of q-tips? Or, as another person noted Myrtle's crush on Harry might lead her to give him some love via the tree, maybe some sort of "M+H=(heart)" ornament, or photos of Harry cut into heart shapes (maybe with the sudsy batting extending around the edges from behind the photos)? The photos are obviously less of a giveaway than including her name, but combined with the audio I think folks would figure it out. Thanks so much for sharing! I can't wait to see the rest of your photos and creations! BTW, I totally thought of your Pensieve Punch a few weeks ago when I found a new item at the liquor store -- VINIQ -- which has the same shimmery stuff included which makes it look magical! VINIQ is only available in purple, red, and yellow/gold varieties, though, so anyone wanting to replicate your Punch will still need to hand-make it! What if you did something with a big golden egg - you know, like when Harry brought his egg into the prefect's bathroom in book IV? Maybe somehow have an open golden egg with....her name in? Or...? 'Kay, I definitely need help developing this idea! the golden egg should go in the tub! It was a bit of a surprise, but a big hit! Also, we lipsticked "the chamber of secrets has been opened" on the bathroom mirror for added ambiance. 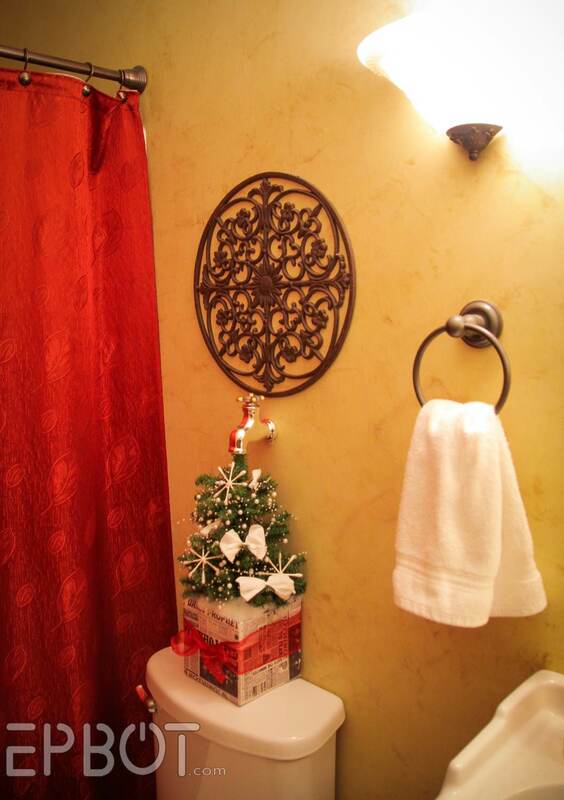 Now I want a tree like that in the bathroom! The soap and bubbles are beautiful and the spigot on top is perfection. Your cleverness kills me! I love the ornaments on the tree! So clever! Could you put a little piece of paper in one of the glass bubble ornament with her name on it? Can you draw the basilisk symbol on the faucet with a Sharpie? You could use an eyeliner pencil on toilet paper tube ornaments hung with floss that say "No Olives", "Go Away! ", and "Myrtle and Harry" in a heart. Love it! Moaning Myrtle in the bathroom is going to be so awesome! And here I was, just cruising along, reading the post and soaking up all the Harry Potter goodness, and what a surprise to see my name at the end of the article! Thank you, Jen! From a long-time reader (but usually silent stalker when it comes to leaving comments). Thank you! That is such a beautiful tree. I lurve it!!! I second (third? fourth?) the small gift under the tree from Harry to Myrtle, I think it's the most subtle way to get the message across. Also love the idea of the basilisk symbol drawn on the faucet. Love, love love this whole thing! A tiny mirror with her name written into "fog"? Maybe etching paste wiped off with a q-tip? I love this idea! Craft stores always have teeny mirrors. Car wax would work too, if you don't have etching cream. This is so, so, so rad. Thank you for sharing your geekery so frequently and so thoroughly. I love it all. 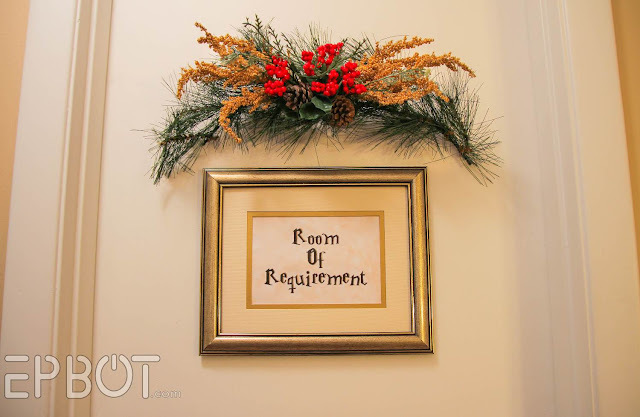 haha, yeah, i saw a similar ornament at hobby lobby, and thought pretty much the same thing.. except i wasn't able to make the creative connection. love love love it!! OMG, that's so awesome!!! I love the soundtrack too. 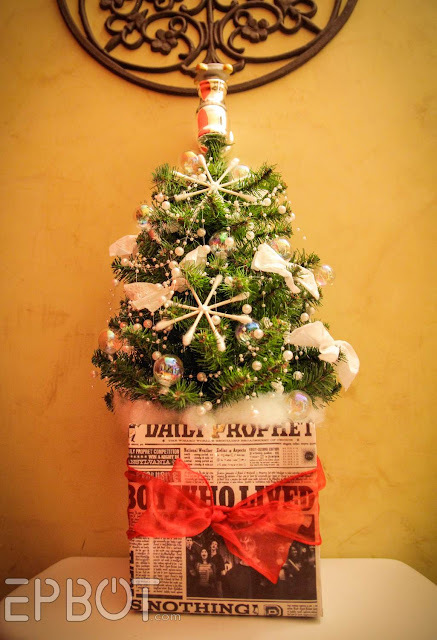 :) To add Myrtle's name, maybe you could add something to the tree skirt/box that says "Property of Myrtle," like school kids label their stuff? This is so awesome. I wish I was your friend in real life (and, you know, lived closer) so I could go to what looks to be an amazing party. (I mean that in the least creepy way possible). Could you carve the name into a bar of soap? You could do a picture of Moaning Myrtle on the bottom (back?) of the toilet lid, so when people lift it, she's staring at them. I cannot handle how adorable that tree is. I made little high pitched noises for a good 5 minutes before I even realized the ornaments were bathroom themed. IT LOOKS LIKE IT'S COMING OUT OF THE TAP! I just. There is no room for that in my bathroom and it probably won't really work in the living room but I might have to do it anyway. It is SO CUTE. I luuuuurve how evil you guys are!!! I can't wait to hear how the party goes and to see more of your prep!! This stuff is just awesome! This is sooooo totally coolamatious!!! You guys are my party-planning heroes. I am eagerly awaiting the next party posts. There are so many great places for Myrtle to hide -- perhaps, one of you could visit the loo during the party to move her around for an additional surprise. This is adorable and ingenious! 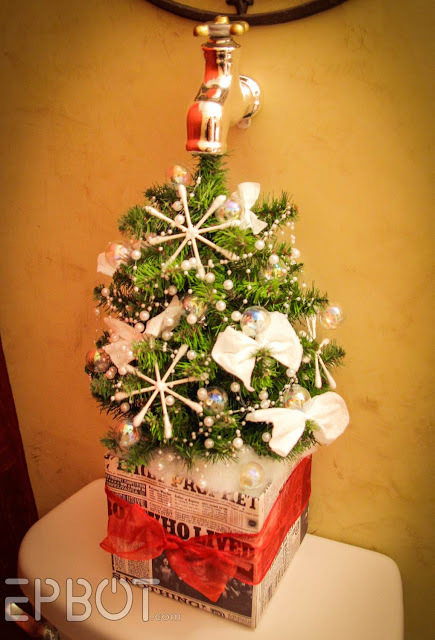 That has got to be the most adorable -- and clever -- little tree in the history of the world! So fun! Can't wait to see the rest of the party! Ok that is just too cool. Myrtle's tree is adorable. Will we see pics of the decorations and whatnots after the party is over? I hope so! For Moaning Myrtle's name you clearly need to put a small box of tissues, with the box itself done up like a Christmas present, and Myrtle's name on the gift tag. Since Myrtle lives in the drain, a bubble of her head peeking out of the faucet? I LOVE IT ALL!!! It's soooooo fantastic! You are AMAZING!!! I don't think I can ever have a party again, knowing how much less fabulous it is than yours. 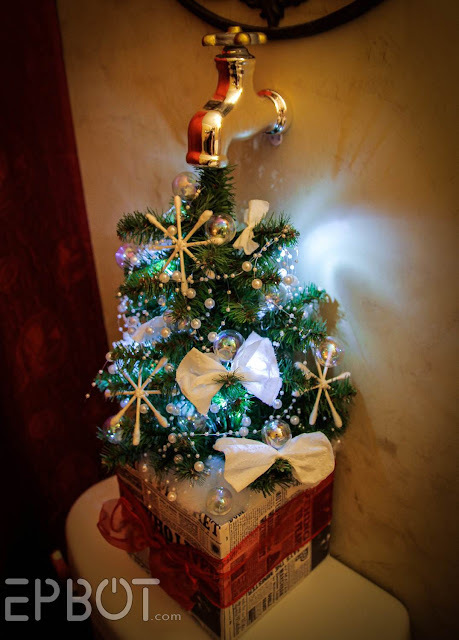 You just convinced me I need to have a Doctor Who mini-tree in my Doctor Who bathroom for my Villains Holiday party.